Framed Poster Geometric simple black and white minimalistic pattern, triangles or stained-glass window. Can be used as wallpaper, background or texture. Framed Poster Seamless pattern with decorative hand-drawn triangles. Poster Geometric simple black and white minimalistic pattern, triangles or stained-glass window. Can be used as wallpaper, background or texture. Poster Seamless hand-drawn triangles pattern. Self-Adhesive Poster Abstract background of the triangles. The gradation of Violet. Violet hues. 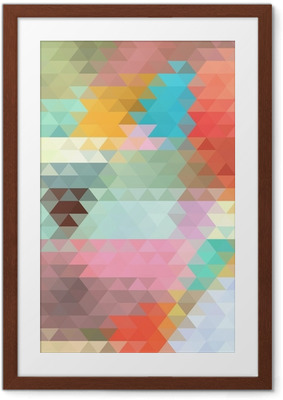 Framed Poster Geometric pattern, triangles background. Poster Abstract geometric colorful background. Mountain peaks. Composition with triangles geometric shapes. polygon landscape. Framed Poster The triangles in shades of green and blue. Framed Poster Seamless geometric pattern with magenta, blue, yellow triangles in pop art, retro 80s style. With lines, zigzag, dot on black background. Poster Geometric abstract background. Triangles. Self-Adhesive Poster Seamless geometric pattern with triangles. Poster Seamless pattern with colored diamonds and triangles.